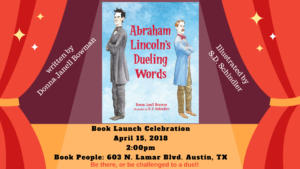 I’ve spent the last several weeks sharing extended content about writing and researching Abraham Lincoln’s Dueling Words. Now that the April 1, 2018 official launch date has arrived, I am reflecting on the people who have supported the book’s journey and my publishing endeavors. My family—Abraham Lincoln’s Dueling Words began in 2012 for me. In the six years of research, writing, rewriting, and revising, life continued. As a gauge, my youngest son was twelve-years-old when I began this project. He’s now a 6’3″ high school junior, and we’re looking at colleges. 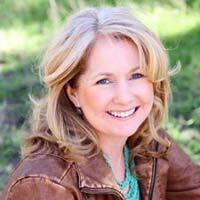 For authors, their books and projects are woven into the fabric of a family in multiple ways. Beyond my writing cave, my human family cheered and encouraged me in small and large ways. To Chris, Ethan, Justin, Pat, Nettie Ruth, Christopher, Stevie, Lori, Sean, Scott, Sean, aunts, cousins—I am grateful for your love, support, and cheerleading! My agent, Erin Murphy, has believed in this and my other books for many years, and I am lucky to have her in my corner. We originally had a long professional courtship before she offered representation. It’s an interesting story that speaks to the business side of agenting, the evolution of a writer, and the age-old advice about never giving up. To this day, it is still a thrill when I see Erin’s name in my inbox. She is the real deal—a knowledgeable industry veteran with the keen eye of an editor, a heart of gold, and the godmother to all my books. 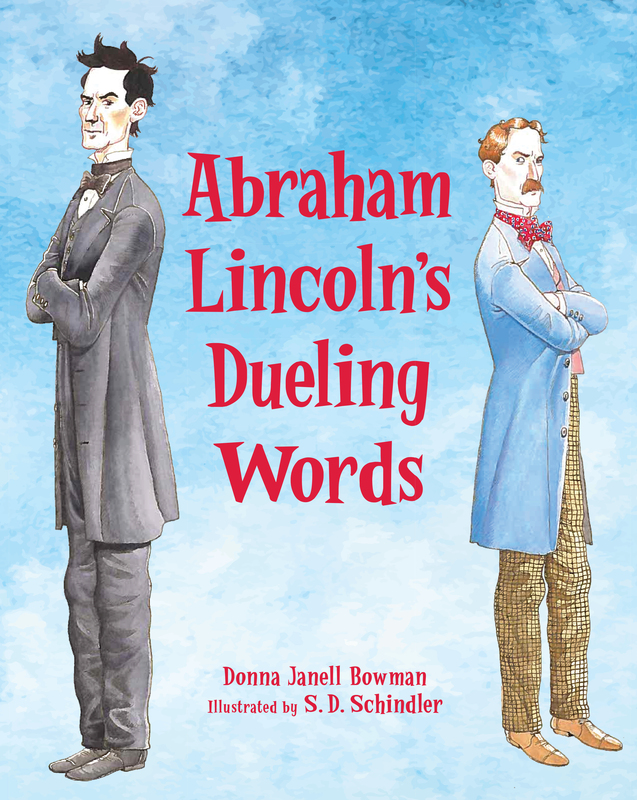 My agent Erin Murphy, editor Kathy Landwehr, and author friend Cynthia Levinson toasted the deal for Abraham Lincoln’s Dueling Words during a 2013 conference. Peachtree editor Kathy Landwehr and I met when she critiqued the Lincoln manuscript during the 2013 Austin SCBWI conference. By the time we met in person, she had already contacted Erin to express interest. 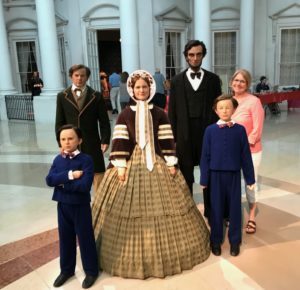 Immediately after the conference, Kathy and I continued our conversation about my manuscript in the hotel lobby on, what we now refer to as, the Lincoln couch. 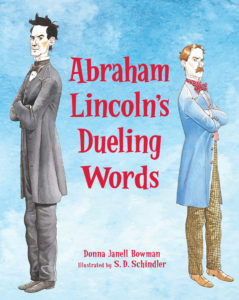 I am so grateful that Kathy’s vision for Abraham Lincoln’s Dueling Words matched my own. We’ve developed a friendship during the process with Lincoln—one that often comes through in mutual snarkiness and banter. What fun, right? In fact, our kindred styles led to a second book deal, King of the Tightrope, scheduled to release in 2019. I owe such love to Peachtree Publishers and the remarkable staff that wrangled everything from art direction to marketing and publicity and conference details. Darby, Elyse, Barbara, Jonah, Nicki, Courtney, Emily, etc.—thank you! Illustrator S.D. Schindler deserves an extra helping of sunshiney rainbows for infusing the illustrations with the perfect blend of fun, frivolity, and historical accuracy. 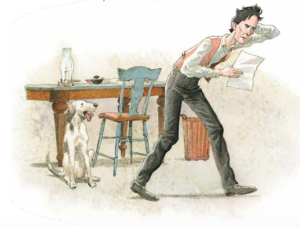 My telling would not be the same without Steve’s gorgeous art! My friends and critique partners offered feedback on early versions of this manuscript, even before Erin or Kathy saw it. There is no better feedback than what comes from experienced writers, and I hit the jackpot in that way. There are many people to thank, but allow me to single out Carmen Oliver, Cynthia Levinson, Samantha Clark, Chris Barton, and Don Tate. And, during one of the profoundly affecting Highlights Foundation workshops I attended, Peggy Thomas, and Carolyn Yoder saw the first draft. 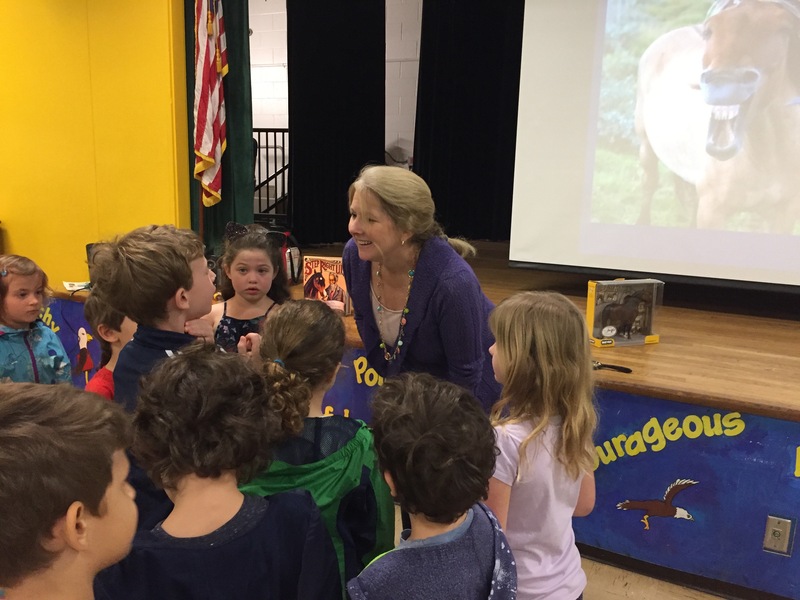 For the past year, I’ve been honored to meet many librarian educators while speaking at schools about Step Right Up. What a special group of people! I am awed by the passion and commitment they have for connecting books with young readers. They know the power of books as escapism, therapy, hope, and dreams. 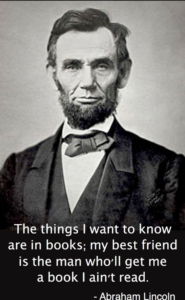 I thank them all for supporting my previous books, for being literacy champions, and for already embracing Abraham Lincoln’s Dueling Words. 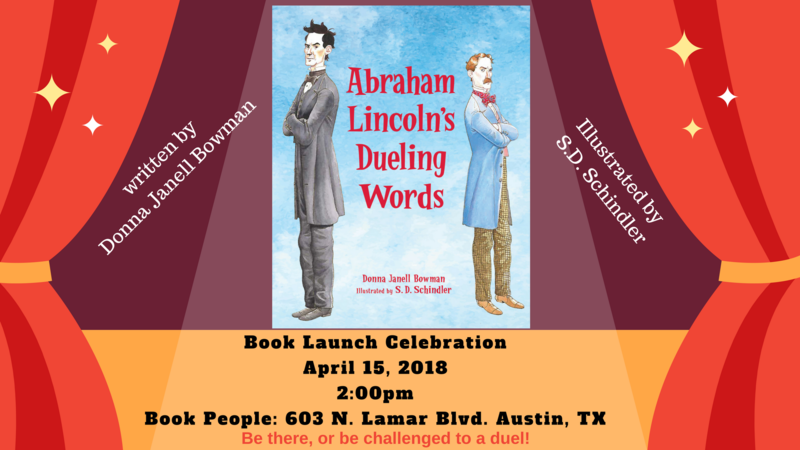 Next up—a book launch celebration at Austin’s Book People. April 15th at 2:00 pm. If you’re in the Austin area, I hope you’ll come by to hear my reading and presentation. 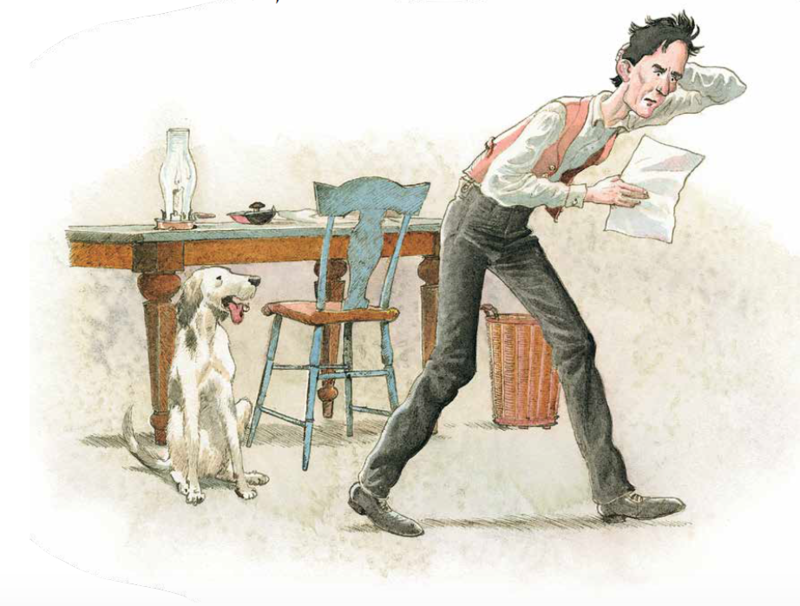 You’ll learn a lot more about Lincoln’s rascally mistake that landed him on the field of honor. And there will be eats and drinks, too. After all, April 15 is tax day, so you know there will be bubbly on hand. 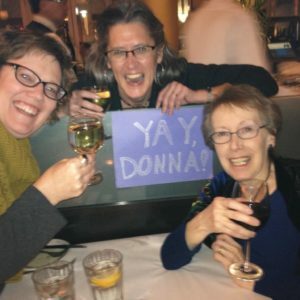 « Meet me at TLA 2018!